Use these Triangle Chrome Wire Grid Shelf to increase the amount of space available for storing your products. 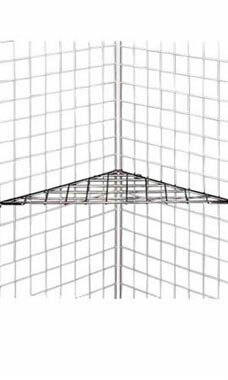 These shelves easily slip onto wire grid panels attached in a "V" formation, leaving no corners empty and plain. Furthermore, these wire corner shelves are a perfect fit for any wire grid panel and create interesting displays, attracting customers, helping to close the sale.